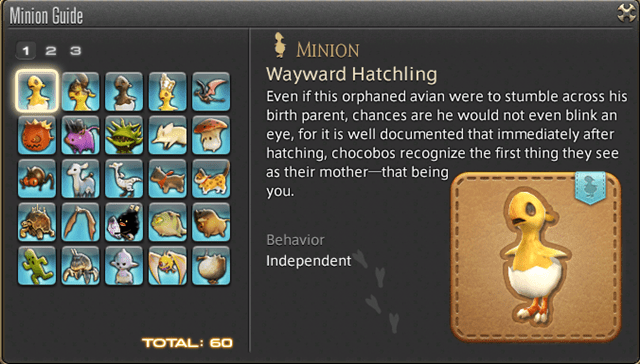 One of my favorite things in any game is the collection of mini-pets and in Final Fantasy XIV they have a truly silly amount of them. In talking to a guildie today I realized just how contorted it is to try and figure out how to get each of them. They come from vendors, achievements, quests, an random raid and dungeon drops. I thought for today’s post I would attempt to pull together a rudimentary list of where you can obtain which minions. This will likely not be a complete list, but it is a good first attempt. I will try and update it for new data as I find what I am missing. This is probably the least complete of the information I have, but if you really want to find out how to get each of the minions, click the link and follow up to find out where the vendor is located. Some of these require you to complete certain FATEs to get the vendor to show up. Anything marked Special event means it is from a holiday event or similar limited time happening. This next batch are vendor purchased, but require you to gain a certain amount of faction with a given beast tribe to access the minions. It looks like each faction has two different minions. This category of minions is obtained either through a crafted pattern or through harvesting. Click through to the minion to find out specifically what it takes to obtain each. There are a number of minions that can be obtained through the completion of quests. Here is a list of those that I know of, as well as the quest that goes with them. Be warned looking at the quest might be a bit of a spoiler at times. Anything marked Special event means it is from a holiday event or similar limited time happening. There are a number of minions that are associated with the completion of an achievement. I’ve attempted to link the achievement to help you figure out what it takes to get each one. Some of them are extremely involved. There are a number of minions that are obtained through the completion of specific FATEs. Generally speaking these require you to get gold completion on the FATE in order to earn the minion. These drop each time you get gold, meaning they are often extremely cheap on the market board. With the introduction of the treasure map system, there are a number of extremely rare and highly sought after minions that come from completing these maps. From what I understand it is a sub 1% chance of getting one of these minions, because of this… they go for millions of gil each. Good luck! When the housing garden plots were introduced, there are a number of minions that can be in essence grown. Each of them requires you to do some truly contorted things to get a rare seed… that will then grow into the minion. I don’t know the specifics but hopefully you can research how to do this elsewhere. I am just providing a list of minions. Similar to the Treasure Map minions… there are minions that have an exceptionally rare chance of being returned from Retainer ventures. Most of these come from exploration ventures of specific gathering types. The rarity causes them to generally be priced in the millions. Hopefully you will have some extremely good luck. There are a number of minions that can be found as somewhat uncommon drops in various dungeons. Several of these started as 100% chance drops, but as the market was flooded, Square decided to dial back the drop chance making them significantly rarer. The best option for these is to farm them by running the dungeon multiple times. A Number of the raids and trials drop minions. Generally speaking when a trial drops a minion it is dropped every time you successfully complete it. When a raid drops one, there is a chance it may or may not drop the minion. The problem with raid drops is you are having to roll against potentially 24 other players… which means you need to roll exceptionally well to have a shot at walking away with it. Final Fantasy XIV has easily one of the best veteran rewards programs, rewarding players for subscribing to the game with various items. At each step you get a minion, so I have jotted down the minion and the number of days subscribed you have to reach to earn it. 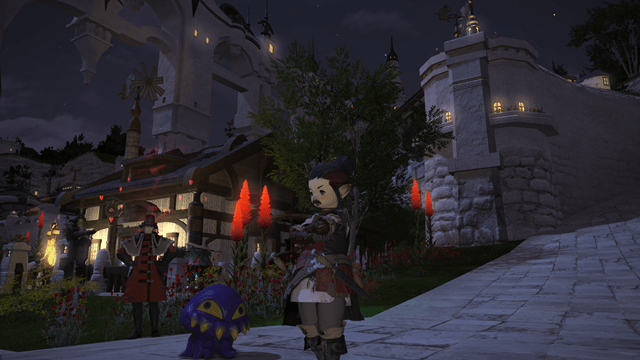 Recently Square Enix introduced a number of RMT minions available through the Mog Station. Each of these runs roughly $5. So far these are limited to the various scions apart from Minfilia that comes from the yearly anniversary event. There are a handful of items that can be purchased that have a pack in code for a specific minion. These are all exclusive and cannot be obtained through other means. Finally there is one other very specific minion that can only be obtained through attending an Eternal Bonding ceremony. Having not actually done this myself yet, I am uncertain how this process works but I would assume it becomes purchasable after you attend. That ladies and gentlemen is all of the minions that I happen to know about. As they add more to the game I will try and keep this guide updated. Tomorrow the 2.51 patch lands and with it I am sure more minions. Also if there are other minions not included in this guide that you know how to get, please let me know and I will copy over the information. Hopefully someone out here will find this information useful. I hate mini-pets and I hate that you put so much effort into creating what looks to be a phenomenally good guide on them. Maybe next time you could write a guide to which vistas are best to screenshot? The world revolves around my opinions and interests, dontchaknow?